If you have rheumatoid arthritis (RA), you may wonder if developing rheumatoid nodules is inevitable. Rheumatoid nodules are firm, non-tender, subcutaneous (under the skin) nodules that tend to appear on fingers and knuckles, elbows, knees, and forearms. They can also form in the eyes, vocal cords, and internal organs, but this is rare. 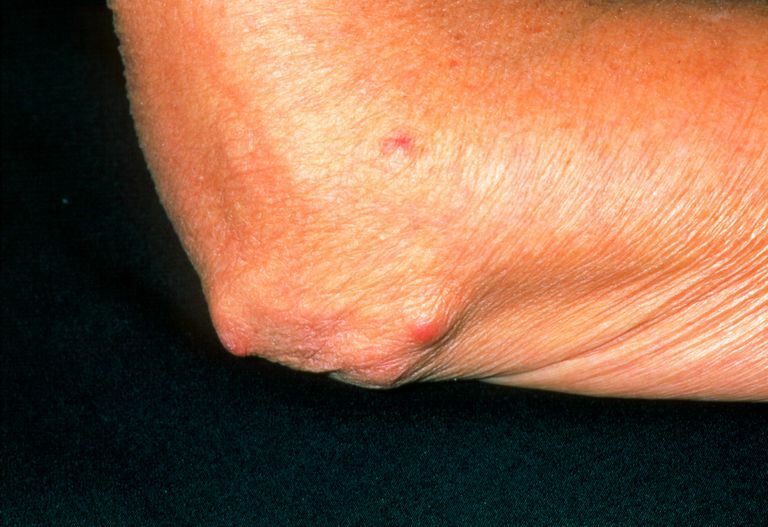 Up to 35 percent of people with rheumatoid arthritis will eventually develop nodules. Rheumatoid nodules are more likely to occur in RA patients who have been living with the disease for a long time and in those with more severe forms of the disease. Nodules are also more likely to occur in patients who have extra-articular disease (meaning RA affects parts of the body other than just the joints). About 7 percent of patients have nodules when they are first diagnosed. Having nodules at diagnosis is associated with more significant joint damage down the road as well as systemic complications. Having a high level of rheumatoid factors in your blood also predisposes you to nodules. Rheumatoid factors are proteins produced by your immune system that can attack healthy tissue in your body; they are responsible for several types of autoimmune diseases. Rheumatoid factor is present in 70 percent of people with rheumatoid arthritis. It also occurs in several other diseases, such as cancers, systemic lupus erythematosus, hepatitis, and some other infections. Some people without any disorder, particularly older adults, have rheumatoid factor in their blood as well. Patients who test positive for an antibody known as anti-cyclic citrullinated peptide (anti-CCP) also have an increased risk of developing nodules. Anti-CCP antibodies are present in over 75 percent of people who have rheumatoid arthritis and are almost always absent in people who do not have the disease. The risk of developing rheumatoid nodules is also higher among RA patients who smoke as well as those who are taking the drug methotrexate, a common RA medication. Rheumatoid arthritis patients who are bedridden can form rheumatoid nodules on pressure points, such as the backs of their elbows, legs, hips, or sacrum. Sometimes rheumatoid nodules may form on the scalp at the back of the head. Caplan syndrome—which causes nodules to form in the lungs—can occur in people who have rheumatoid arthritis in addition to pneumoconiosis, a lung disease caused by inhaled toxins such as asbestos and coal dust. While all of these are known causes of nodules, experts still don't know for sure why nodules develop in some RA patients and not in others. It is thought that there may be a genetic component. Rheumatoid nodules are painless masses of inflammatory tissue, generally measuring between 2 millimeters and 5 centimeters and appearing as a single mass or in clusters (called micro-nodules). They are usually round, occasionally linear, and usually not painful. When multiple nodules form in one location, such as on the fingers or backs of the hands, this is called accelerated nodulosis. This manifestation is more likely in those taking the drug methotrexate. The subcutaneous nodules are typically moveable and have a rubbery feel. Those that are attached to bones or tendons usually feel firm or hard to the touch. During a flare, the nodules may become painful. Nodular masses can also occur with gout (called gout tophi), rheumatic fever, xanthomatosis, and sarcoidosis, among other conditions. One distinguishing feature of rheumatoid nodules is that they rarely ulcerate or come through the overlying skin. When nodules occur in these locations, they can be hard to identify or diagnose properly. Nodules can be asymptomatic (as is usually the case with lung nodules, for example) or may overlap with characteristics of other conditions. Occasionally, the skin over a nodule will become infected or ulcerated. This tends to occur in areas that are subject to pressure on a regular basis. When nodules form on the backs of heels or bottoms of the feet, they can limit mobility and potentially be debilitating. Having rheumatoid nodules, especially at the time of diagnosis, indicates a higher risk of developing systemic inflammation (as opposed to it being limited to the joints). This, in turn, can increase the risk of kidney disease, lung complications, heart attack, and stroke, as well as inflammation of the blood vessels, known as vasculitis. Rheumatoid nodules may disappear over time, or they may get smaller or larger. There is currently no way to predict which nodules will change or go away on their own. Nodules can be unsightly, but they are only occasionally debilitating, so they aren't usually treated aggressively, if at all. Sometimes, the skin around a nodule can become infected or ulcerated. In these cases, treatment of those complications is necessary. Treatment with DMARDs or TNF blockers, used for rheumatoid arthritis in general, may or may not eliminate rheumatoid nodules. When combined with the drug Rituxan (rituximab), however, these drugs may reduce the likelihood that nodules will form in the first place. Intranodular steroid injections may reduce the size of a nodule. Surgical removal is an option, but nodules tend to recur in as little as a few months after surgery, especially when they exist over an area of repeated trauma, as in the case of bedridden patients. For that reason, surgery is usually discouraged. If you are concerned about your nodules, talk to your physician about the available treatment options. Cush JJ, Weinblatt ME, Kavanaugh A. Rheumatoid Arthritis: Diagnosis and Treatment. West Islip, NY: Professional Communications; 2014. Davis JM. Rheumatoid Nodules. UpToDate. Firestein GS, Kelley WN. Kelleys Textbook of Rheumatology. Philadelphia, PA: Elsevier/Saunders; 2013.